Usually caused by a mild bump or blow to the head, a concussion is a mild brain injury. This often happens if your child has fallen, was involved in a sport, or was hit in a car accident. Concussion is dangerous. Talk to your doctor right away if you suspect concussion in your children. Vomit or nausea. Some will throw up from fear and shock, but if it continues or appears with other symptoms, it is a cause for concern. If your child is so young that he/she is not able to talk, keep an eye out for fontanel bulges, lethargy, vomiting, trouble with feeding, and crying that is abnormally high-pitched. Every concussion happens under different circumstances, causing differences in severity. Treatment is dependent on the condition of the child and the situation. Therefore, physicians are important in determining treatment. They will ask you about the injury, what happened and what your child’s symptoms are. They may want to examine your child. They may suggest an MRI, CT or neurologic exam. 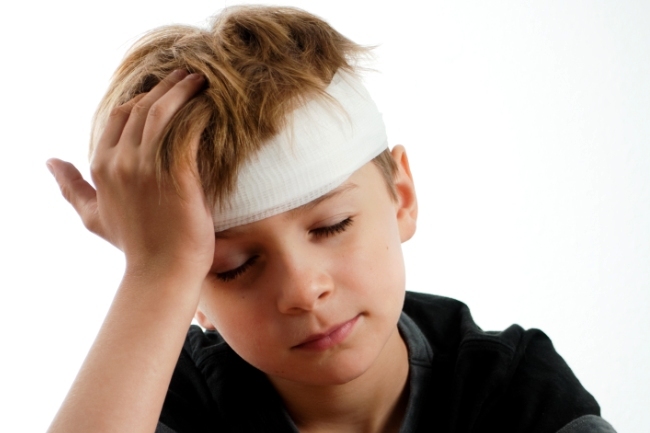 Concussion in children may mean brain injury and require professional treatment or hospitalization. If you don’t need to hospitalize your child, your doctor may provide instructions for care at home. This includes keeping a close eye on your child for up to 72 hours after the incident. If there are new symptoms or any gets worse, you will need to contact your doctor. Get rest. This means refraining from physical activities or sports until fully healed. When symptoms are still present, children should only do the most basic daily living tasks. This will help keep the stress away and allow their brains to heal. It will also keep the risk of reinjury minimal. Rest mentally. Some thinking activities or cognitive activities could make symptoms more prominent. These tasks include using the cellphone, computer, and other devices, reading, doing homework, playing video games and even watching TV. They should also avoid having to make fast decisions or react quickly. Enjoy a healthy diet and drink plenty of non-caffeinated beverages. Bright lights should be avoided while a child is healing from a concussion, as should loud noises, because this can make symptoms worse. Teens shouldn’t drive, or use heavy equipment. Taking pain killers such as ibuprofen or acetaminophen sometimes is necessary for concussion in children. It is important to remember to treat under supervision of your child’s doctor because symptoms can be masked by the medicine. It’s good for kids to refrain from the activities as long as they are on medication for the pain. You should wait until your child no longer has any acute symptoms or your child can manage when doing thinking activities for thirty minutes. It is encouraged to have your child return to school gradually, such as a couple of half days followed by a day off. This will give him/her a chance to rest if still tired. Avoiding activities like roller-skating, biking, horseback riding, etc. Their thinking capacity has returned. They are in full time school. They are handling the homework and some exercise without concussion symptoms returning. They can return to play while supervised. Remember to sit it out if in doubt. It is easiest to get a concussion within a few months of having a concussion. If you are doubtful about your child playing, you should wait it out. Increase your home safety measures. Staircases should have handrails and add bumpers to hard edges of furniture. Secure dressers and book cases to the wall so they won’t get pulled over. Use proper seatbelts, boosters and car seats when traveling. This helps to lower the risk for head injury if there is an accident. Utilize protective wear when playing sports. Use helmets to help protect against brain injury when bike riding, skate boarding and playing contact sports. Seek advice from your doctor to lower your child’s risk of another concussion.